Lucifer looks eager to get out of the cage. After all, Sam put him there, and now it seems that Sam is going to him for help. 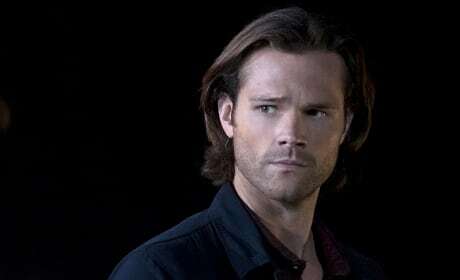 But can Sam trust this ultimate force to help him stop the Darkness? Sam looks worried. And he should be. Trying to summon or contact Lucifer seems like a really bad idea... especially without his brother. He better be careful as he is treading in some dangerous waters. Well, look who is back! Lucifer seems to be making a return appearance. 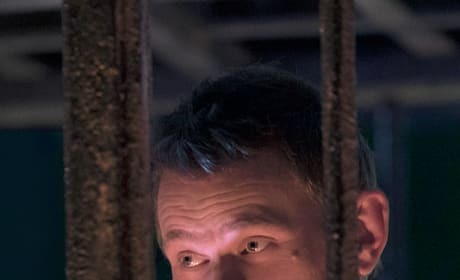 But is he going to help Sam? Does Sam have to get back in the cage with him? Or is he ready to start the apocalypse all over again? 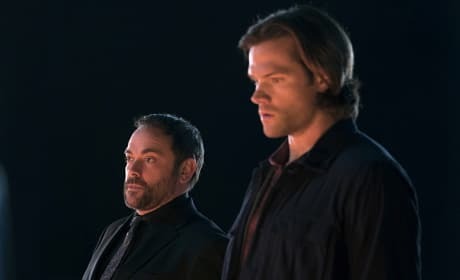 The King of Hell has a rather surprised look on his face, doesn't he? He, Sam and Rowena must be delving into some dangerous magic to get him to look a bit nervous. It's got to be Lucifer's cage! Rowena is back, and she looks to be up to her troublesome self. Hopefully, she's off that Mega Coven kick and proving she can be a big bad. But what spell is she conjuring now? Is she helping a Winchester, perhaps? 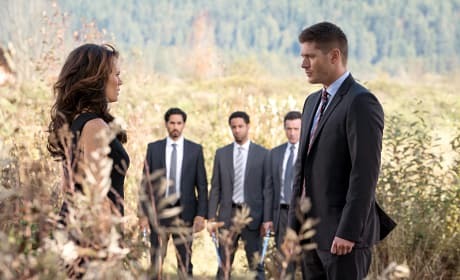 A trio of angels watching the Amara and Dean showdown? That can't be good. They look ready for a fight. Or are they working for the Darkness? Trouble seems on the horizon, and Dean better watch his back from these winged angels of the Lord. 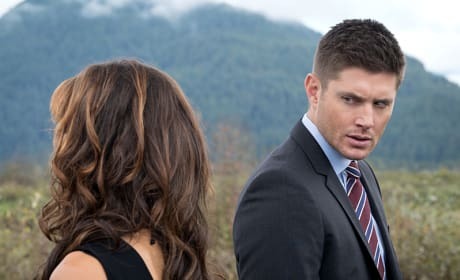 Dean is giving one intense stare toward Amara/the Darkness. There's no way he trusts her, even with their bond. Is he ready to take her down? Or might she have a proposal for him that could change everything? Amara must be the power player as she looks to have aged again. But is she facing off against Dean? Is she challenging him? Or is she looking to team up? After all, they do have a mighty powerful bond. 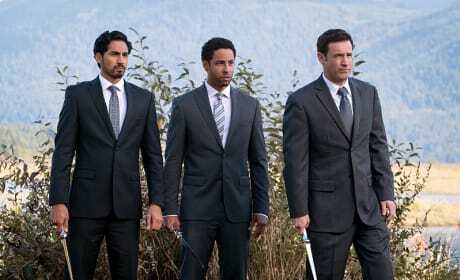 Dean may be looking snazzy in that suit, but he's going to need a lot more than good looks to take down the Darkness. She seems to be at full power (or at least close to it), and having some angel backup is going to give Dean quite a challenge.